The very first thing for you to know is: we can recommend this casino. It’s a good, safe, old and reputable online casino, and you can play in it without any doubts. Of course, there are no ideal casinos. We always analyze all the problems and negative reviews and there are no casinos without negative reviews – but while some of them have really bad ratings, Ruby Fortune is different. 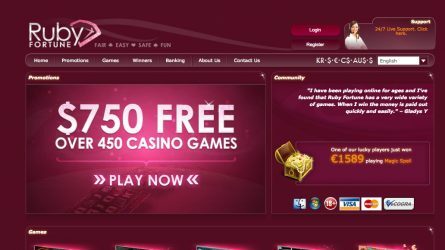 Almost all the clients are satisfied by it, and the problems (if any) seem to be solved fast, so, again: we can safely say that the Ruby Fortune is a good casino.It was created in 2003, and since that Ruby Fortune established itself as a popular casino. What are the reasons? Generous bonuses and prizes, large number of games, good reputation, etc. We are sure you’ll like this casino, like the millions of its clients, but if you are still not sure, we recommend to read this review. We’ve collected all the most important and most interesting facts about Ruby Fortune and checked if they are real in order to make this review. Let’s go! What games does this casino offer? What are the interesting features? All the games here are provided by Microgaming, so Ruby Fortune is another Microgaming casino – you’ve probably already played in such casinos if you are not a new player. This company is a very reputable software developer, and its games are usually exciting, and they also usually have with good graphics and nice sound effects. Moreover, “Microgaming” can be called a synonym of “safety”, not only “quality”. It means that these games are safe and fair – but we’ll talk about it later. Now let’s look at the assortment this casino offers to its players. There are more than 530 games in Ruby Fortune. It’s not the best result among the other casinos, but it’s still much more than an average player need, don’t you agree? You can choose among slots (more than 350 of them – a very, very good choice), poker (58 types of video poker are available, too), blackjack, roulette, baccarat (more than 80 table games), and progressive jackpots (25 types). What you have to know is that 530 is a very big number. It means that you will certainly not be disappointed even if you are a fan of something exotic. 350 kinds of slot machines, can you imagine that? Five reels and three reels, progressive jackpot and multiple paylines, classic machines and all the possible online slot machines are available here, so a slot player will definitely find something interesting. Of course, this casino, like many other online casinos, focuses on those who play slot games. That’s not a surprise and most of the casinos choose this way. However, unlike some other casinos, Ruby Fortune offers a wide assortment of games even if you don’t like slots. Is it a safe casino? What about the licenses? The license of a casino is one of the most essential factors you should pay attention to. As well as its reputation, of course. The thing is: you can play in a casino with no good bonuses or poor support team, but if the gambling license of the casino isn’t reputable, if the regulatory and licensing body doesn’t have a legal power or if the reputation of the casino is clouded, you should stay away from such a casino. But it’s the list of the best casinos, so Ruby Fortune has good reputation and trusted license. It’s licensed by the Malta Gaming Authority, and it means something for every experienced online gambler and player. For all the others we’ll explain what does this license mean. A casino is operating honestly – they don’t cheat neither with random number generators nor with the bonus terms, for example. A casino is real and fair – you money won’t be stolen and you will be able to withdraw your money without any problems. A casino protects your data – your personal and financial information will never be stolen or sent to the third party. Another advantage of the Ruby Fortune casino is that it’s licensed by eCOGRA. It’s a big name in the casino world and you’ve probably already heard something about it. Long story short, this agency verifies the casino and checks if the games are really fair. Some casinos lie to their clients – sometimes it’s just impossible to win money in them, and we are sure you know how sad it is. ECOGRA certificate is another proof that the random numbers are really random here and you have all chances to win in Ruby Fortune. The encryption technologies at this website are advanced, too. Not just your funds, but also your information is protected here – the technology is the same the banks use, so don’t worry about that. Does the support really supports players here? You can call them, write an email or talk with them in a live chat that is available round the clock. It’s a perfect customer support and nowadays almost all the best casinos offer such options for their customers. According to some of the Ruby Fortune casino reviews, sometimes the problems with the live chat can occur (like the chat isn’t available or the support specialists make you wait a long time). However, this kind of problems is common for all the online casinos in the world (or at least for all the casinos we know) – the good news is that such problems are usually very, very rare. You can trust the online support of Ruby Fortune and they will most likely help you to solve all of your problems, if any. What about withdrawal? Are there any problems with it? You can choose among different options, like bank transfers, electronic wallets, credit and debit cards, Neteller, Skrill, PayPal, etc. What’s more interesting, unlike the other casinos, Ruby Fortune doesn’t limit you when you withdraw your winnings. You can withdraw as much as you need, but not less than $10. You can also deposit as much as you need – the limits are the same, your deposit must be more than $10. We highly recommend to use electronic wallets to withdraw your money. The reason is: you will have to wait 1-2 days to get your money to your e-wallet – it’s the fastest method. If you use your credit or debit card, you’ll have to wait 2-5 days, and if you want to withdraw your winnings to your bank account, it may last up to 7 days (please mention that it’s 7 business days, so if you withdraw at Monday, you will get your money at the next Tuesday or even later). So, if you use your electronic wallet, it would be very fast. Another thing you can do to speed up the process is to become a member of the VIP club. The VIP clients’ withdrawals are proceeded with the highest priority. What are the bonuses here? Anything interesting? Ruby Fortune is a good casino, as we’ve already said. Interesting bonuses aren’t the essential part of a good casino, but it’s always fine to have cool bonuses, especially if you are a new player. The bonuses the casino gives to you when you make your first deposit are called “welcome bonuses”, and Ruby Fortune is good at it. Well, it’s not the worst, let’s say. This casino offers 100% match bonus for your first deposit (up to $150), 50% for your second deposit and 25% for the third one. It’s an average bonus and there are nothing special in it, except the wagering requirements – they are 50xb, and it’s very high. It means that you have to bet your bonus for 50 times before you will be able to withdraw any winnings. In other words, the funds are locked and you can’t withdraw them until all the requirements are met. Of course, it’s not the best bonus in the world, and we’ve seen many Ruby Fortune reviews in which the clients weren’t satisfied because of it. Another type of bonuses is loyalty bonuses – almost every casino offers such bonuses. They do it in order to attract the experienced players (unlike the welcome bonus that is focused on the new players). If you are a loyal player, you can go through 6 levels of loyalty program – the more loyal you are, the more bonuses, gifts and invitations to the worldwide events you will get. What countries are in the restricted list? Unfortunately, the citizens of 36 countries can’t play in Ruby Fortune. If you are from the USA, the United Kingdom, Italy, Spain, Turkey and some other countries, you are not allowed to play in this casino – sometimes proxies can help, but we don’t really recommend to use them. There may be some problems when you will withdraw your money, so you’d better not risk if you live in one of those 36 countries.